ISRAELI PRIME MINISTER Benjamin Netanyahu has said his country ”utterly rejects” a proposed deal on Iran’s nuclear programme being hammered out in talks in Geneva. Israel has been enraged by news emerging from Geneva where the so-called P5+1 group of Britain, China, France, Russia, the United States plus Germany are meeting with Iranian officials for the latest round of talks over its controversial nuclear programme. Officials have said a long-awaited deal on curbing Iran’s nuclear ambitions may be finally within reach, after years of fruitless talks were given fresh momentum by the election of Iran’s new President Hassan Rouhani, seen as a relative moderate. “I understand that the Iranians are walking around very satisfied in Geneva, as well they should be because they got everything and paid nothing,” Netanyahu said, speaking as if a deal had already been done. “So Iran got the deal of the century and the international community got a bad deal, this is a very bad deal. 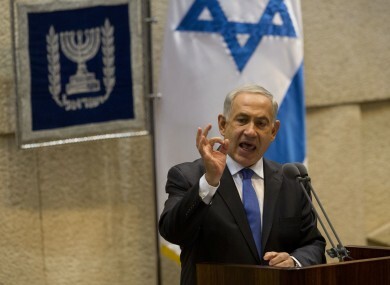 Israel utterly rejects it,” he said, stressing that the Jewish state would not see itself as bound by any such agreement. Israel, which has the Middle East’s sole if undeclared nuclear arsenal, sees a nuclear-armed Iran as an existential threat and has consistently refused to rule out a pre-emptive military strike to prevent that from happening. Iran denies its nuclear programme has a military aspect, insisting on its sovereign right to enrich uranium, saying it is for peaceful civilian purposes only.